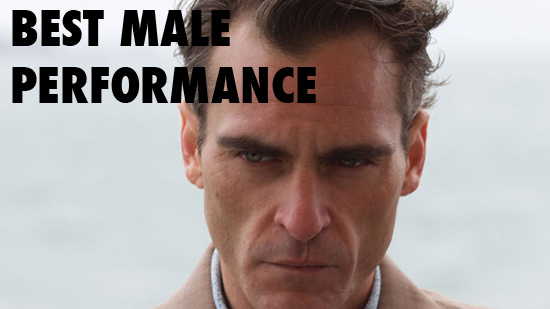 Best Male Performance: Joaquin Phoenix in "The Master"
2nd Place — Scoot McNairy in "Killing Them Softly"
Denis Levant - "Holy Motors"
Scoot McNairy - "Killing Them Softly"
Allowing second-place votes for categories where The Master was going to dominate was the best idea we had this year. It takes away some of that monotony of inevitability, and lets us recognize an amazing performance like Scoot's that has otherwise gone largely ignored by the non-Xixax film world. It's categories like this that really reassure me we have better taste than most. 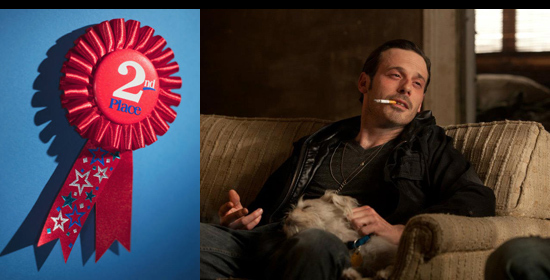 I still think that Scoot was the least of the nominees, and I liked him quite a bit in Killing them Softly. Five amazing perfomances. Just out of interest, were the second place votes weighted any differently from sole votes or was a vote for a Master winner plus another both counted as equal? If I'm understanding the system we used correctly, technically, both a vote for The Master and your second vote were given equal weighting toward the ultimate result. However, as we anticipated, there were no categories in which The Master was nominated that would have been close enough to have made a difference one way or the other. Yes, they were given equal weight. So for example, if Sleepless voted for JP and Scoot, and Lottery voted for only Scoot... that's 2 votes for Scoot, 1 for JP. I counted the bonus votes separately on the opposite side of each entry (trust me, it was intuitive) so I could see how many main votes and bonus votes something had at any given time. When it was time to choose the runner up, the main votes and bonus votes for that nominee were all counted. It was interesting to see how the Master voters would pull one nominee ahead of the others. This also means we didn't assume The Master would win anything. By distinguishing the type of vote, everything was given a chance to beat The Master. Which didn't happen.... not even in the poster and trailer categories.